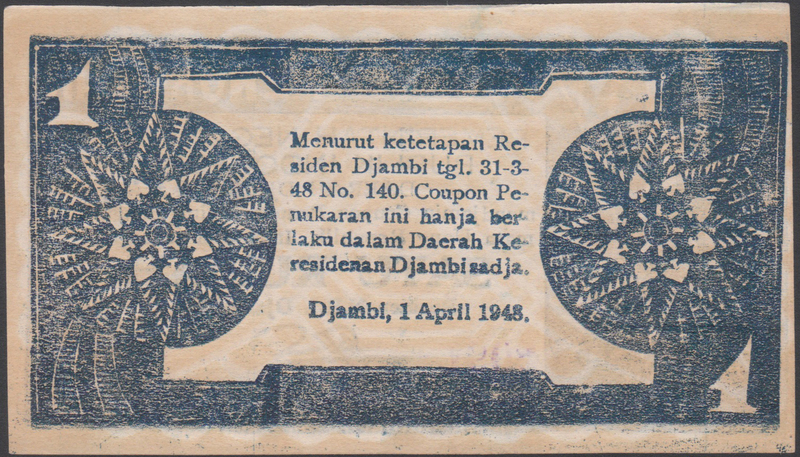 Djambi – The serial letter combinations on the yellow notes issued in 1947 and 1948. 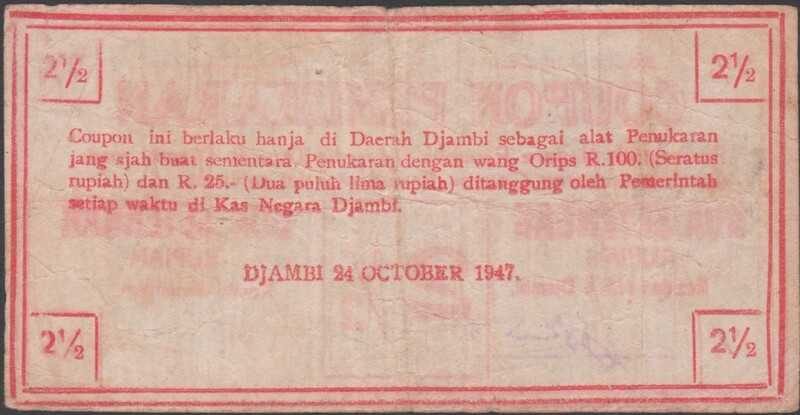 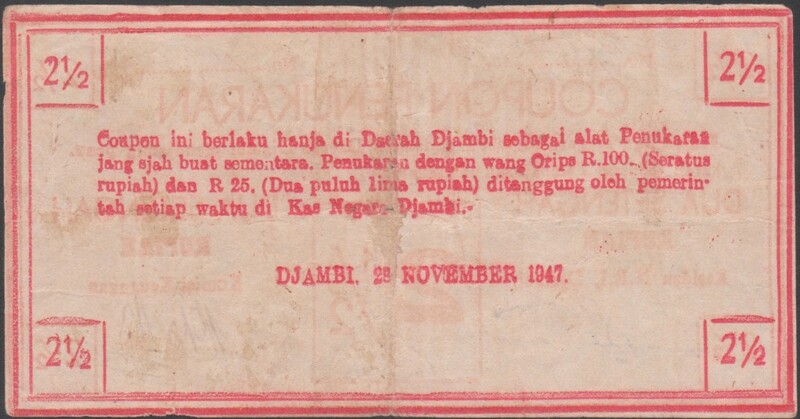 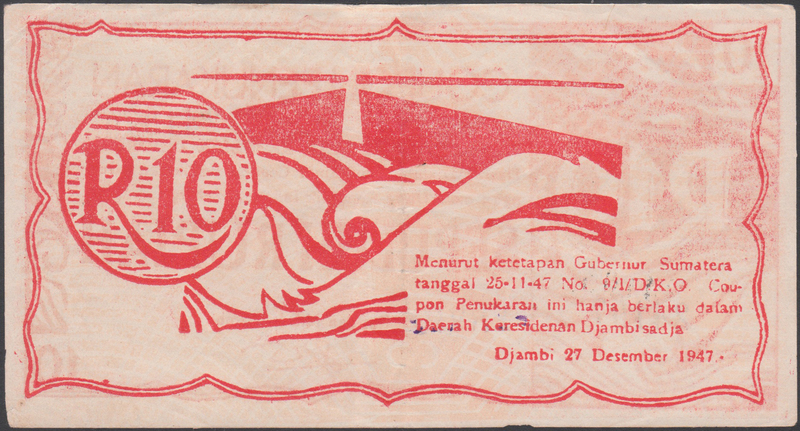 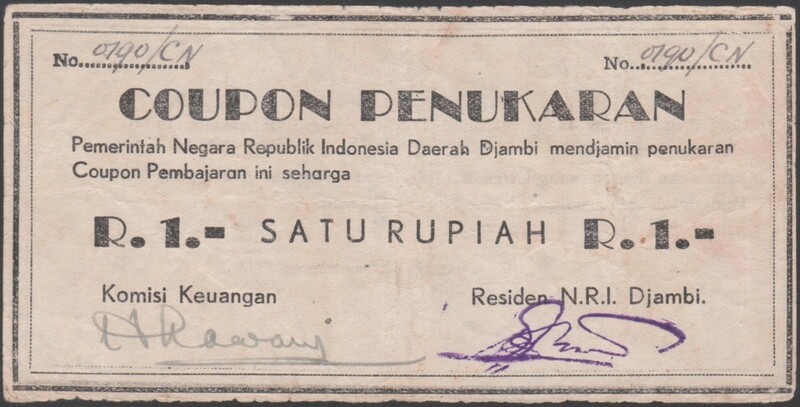 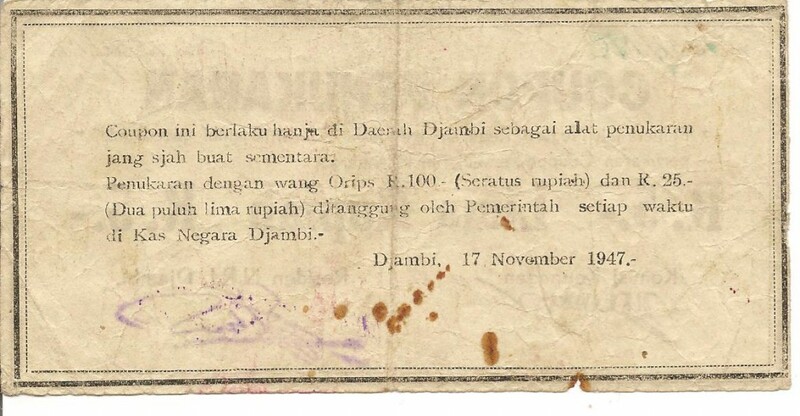 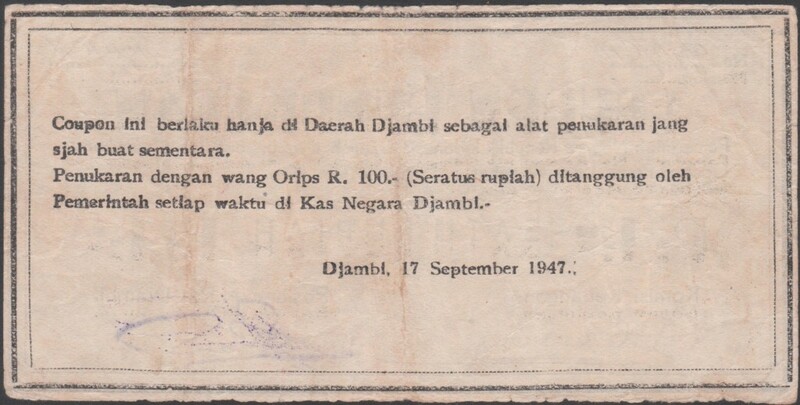 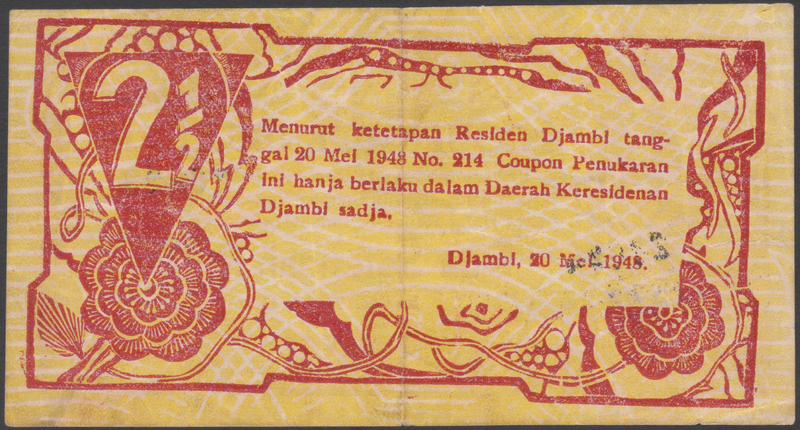 From 27 December 1947 to 20 May 1948, emergency paper money was issued in the Djambi residence by the Indonesian republican authority. 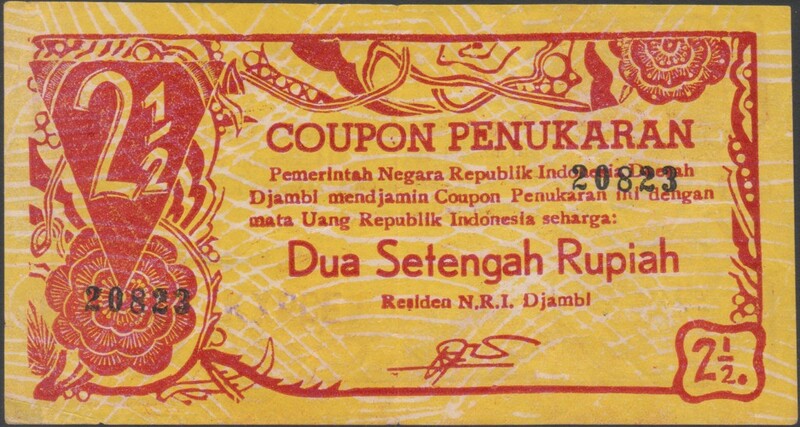 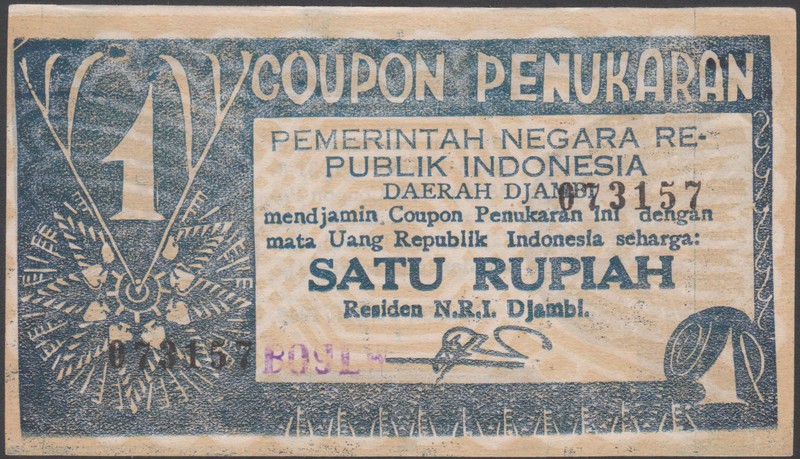 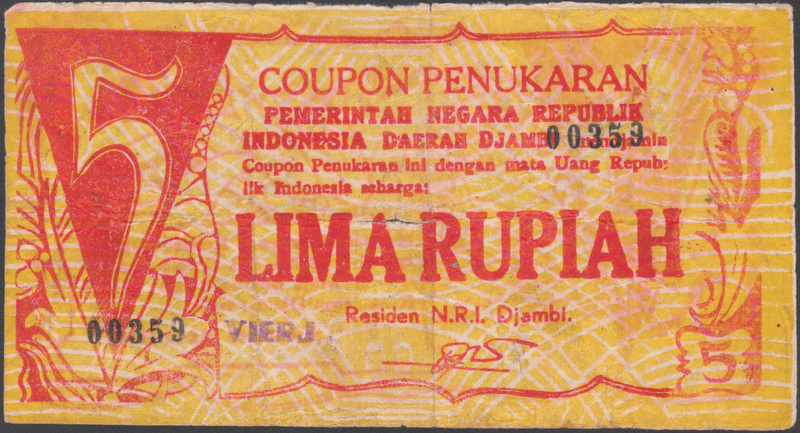 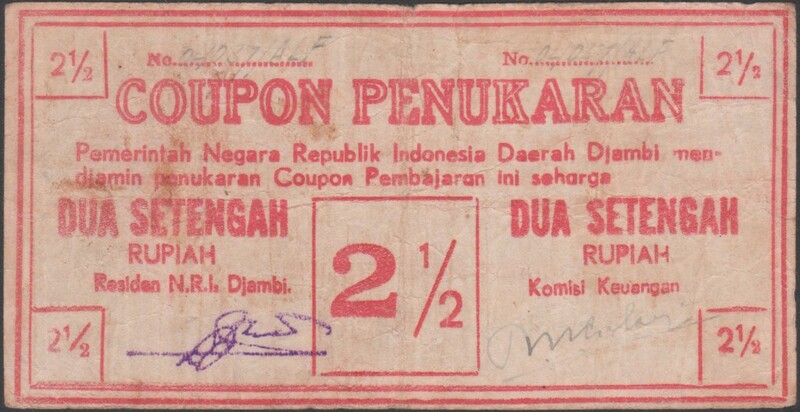 All notes carry the description “Coupon Penukaran” (exchange note), indicating the temporary character of the emergency notes. 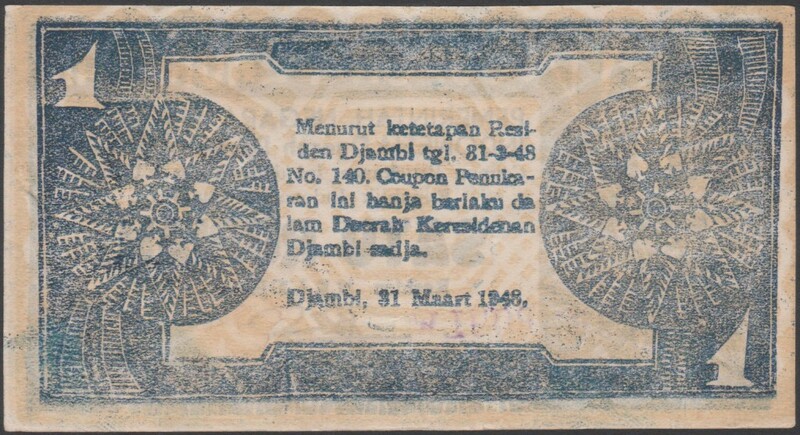 After the first Dutch ‘police action’, the distribution of centrally issued money (initially printed in Pematang Siantar and later in Bukittinggi) had become difficult and money scarcity occurred locally. 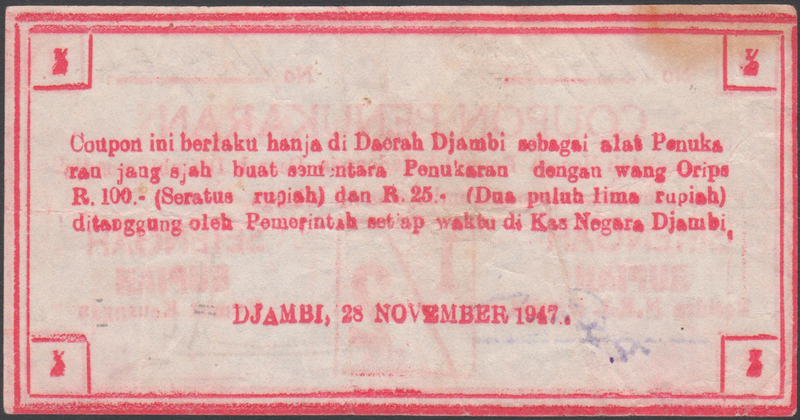 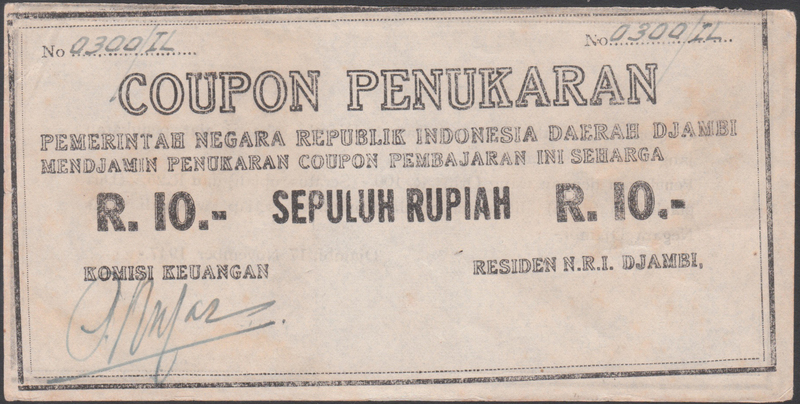 As a result, the Indonesian republican authority issued emergency money in Sumatra on a large scale after the middle of 1947. 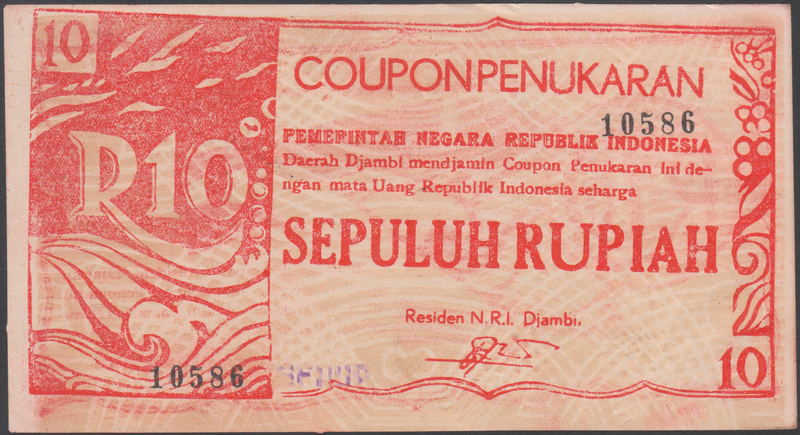 These notes show a large variety of signatures and serial numbers. 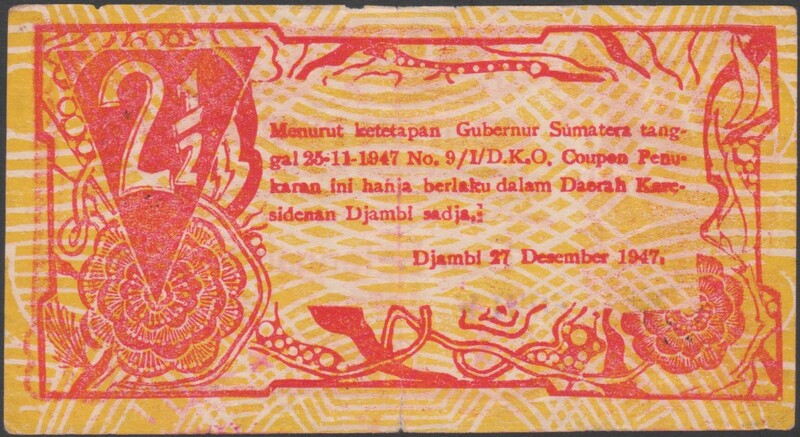 A second series of notes was issued during the period December 1947 and May 1948, printed on paper with a yellow background color. 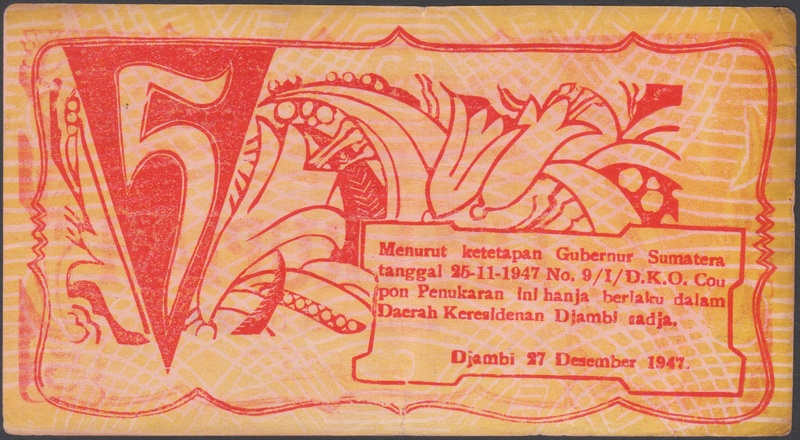 The design of these notes is less primitive than the first series. 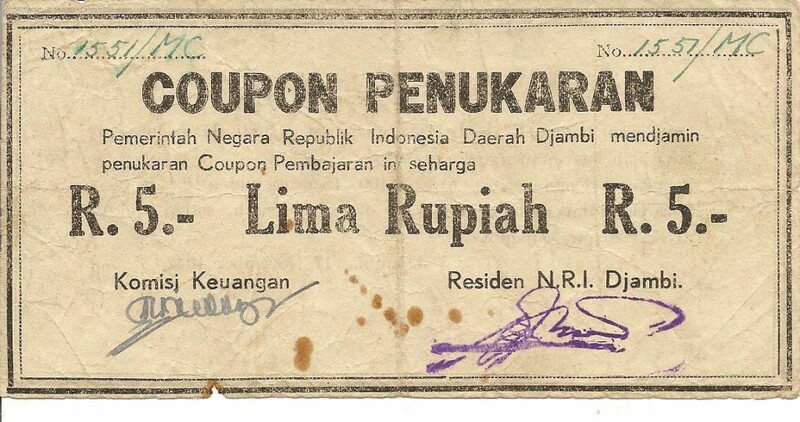 The only one signature – of the republican resident – is now printed. 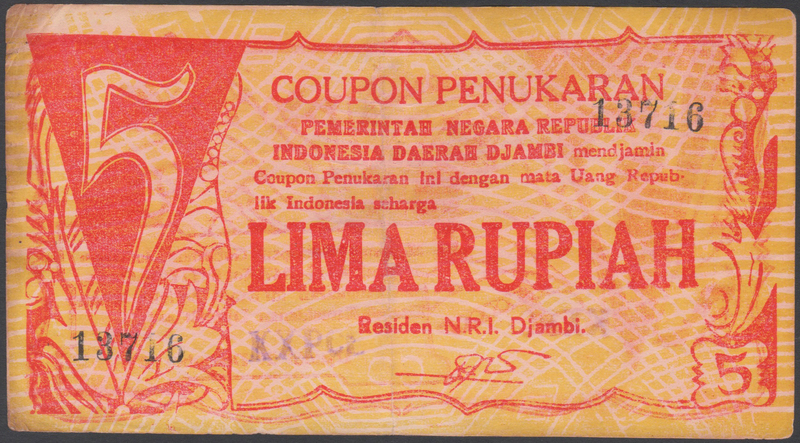 1 KlXPCE is not observed, however KeXPCE is known. 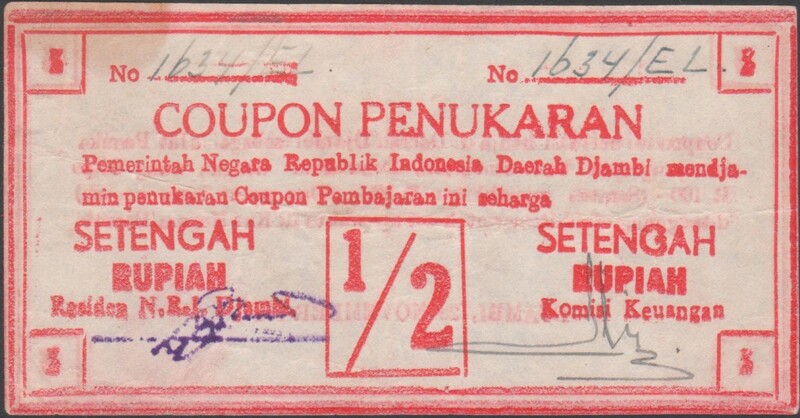 Possibly the letter ‘e’ is used to avoid confusion between the letter ‘l’ or the number ‘1’. 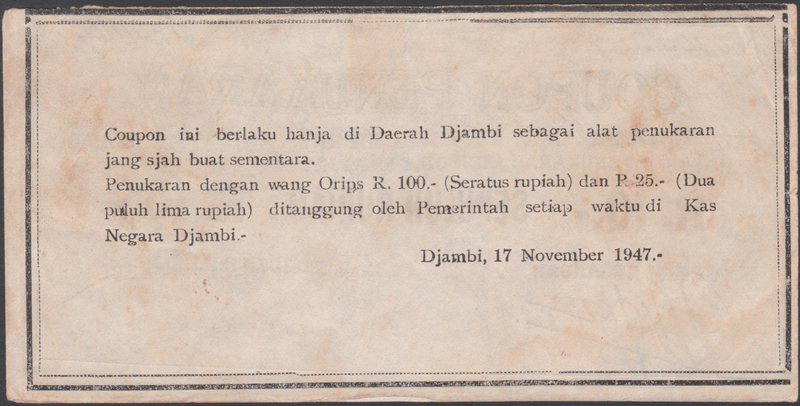 Obviously a number of alphabets were used in different sequences. 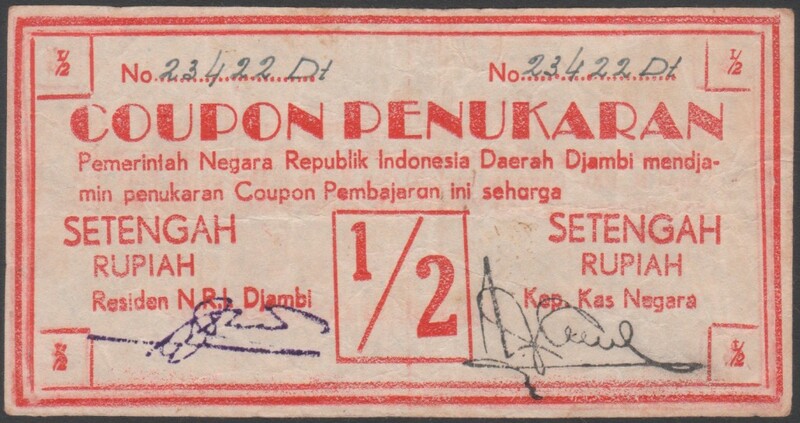 Maybe individual letters from a stamp box were used. 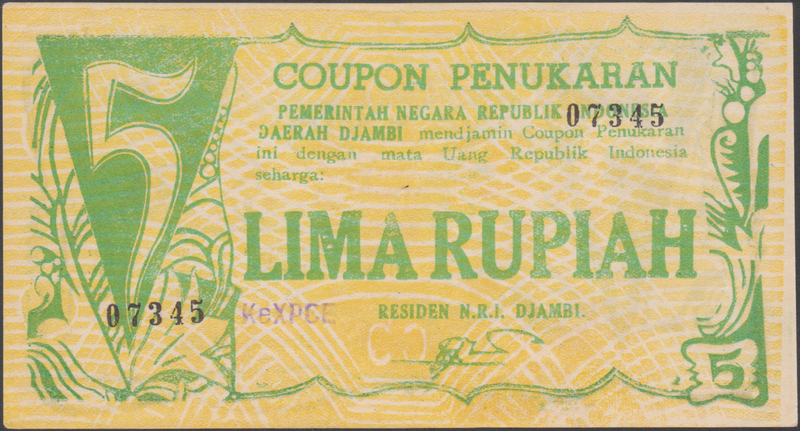 It is possible that the combinations were applied as a security measure. 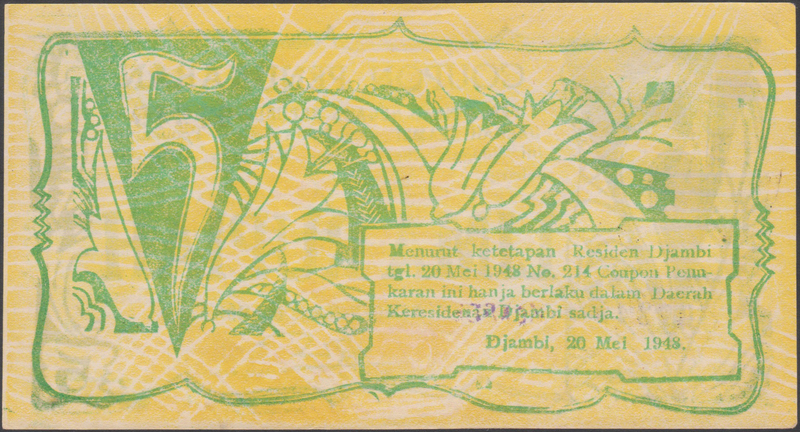 It is a fact that notes with letter combinations outside the array always appear to be fakes when examined closer. 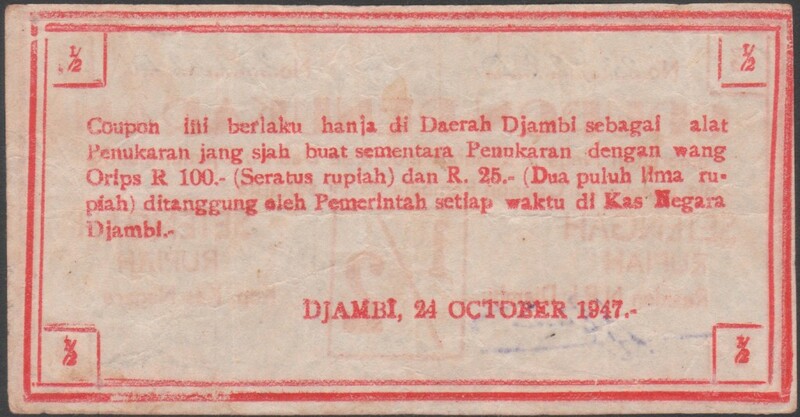 When observing the letter combinations of a large number of yellow Djambi notes, it becomes clear that – apart from the above mentioned – the letter combinations seamlessly continue from one denomination to the next. Below is an overview of the know combinations and the likely sequence of the not yet observed combinations. 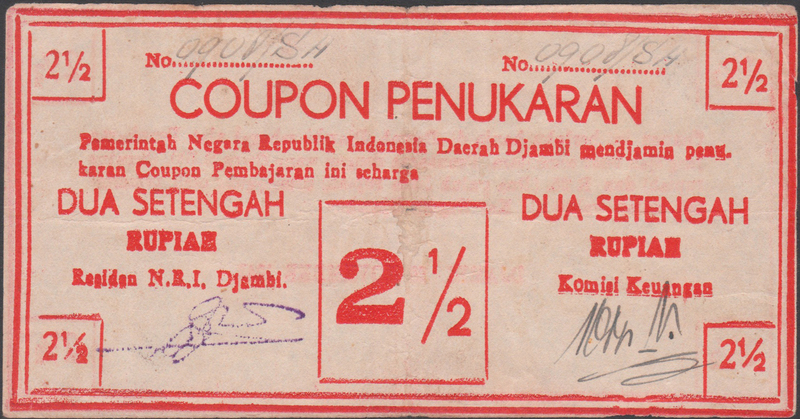 The observed combinations are in black, and the assumed but not yet observed combinations are in red. The not yet clear transition of the serial letters of the 2 ½ rupiah is marked in blue. 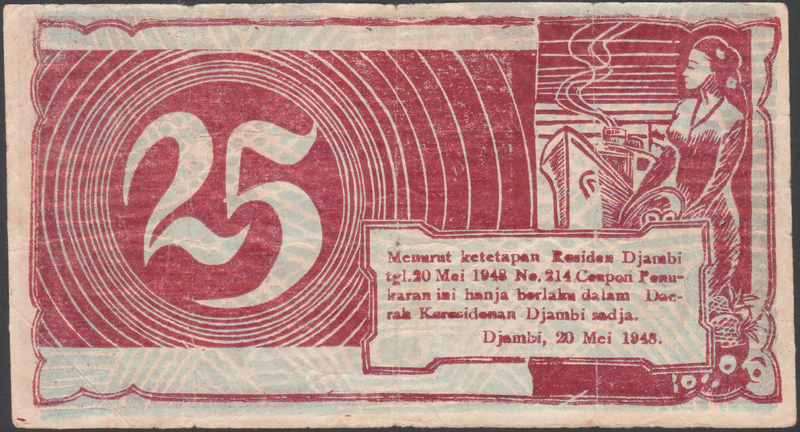 Where applicable it is mentioned which combinations occur with numbers printed with a numbering machine having a number height of 5 millimeters or 5 ½ millimeters. 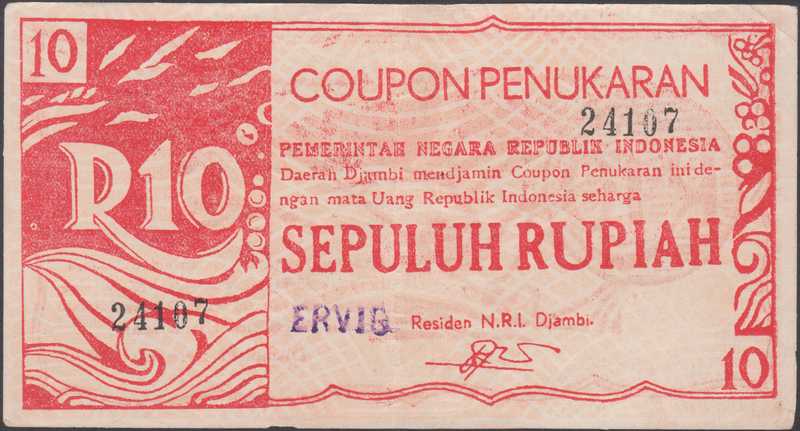 4 There are large quantities of this combination available on the collectors market. 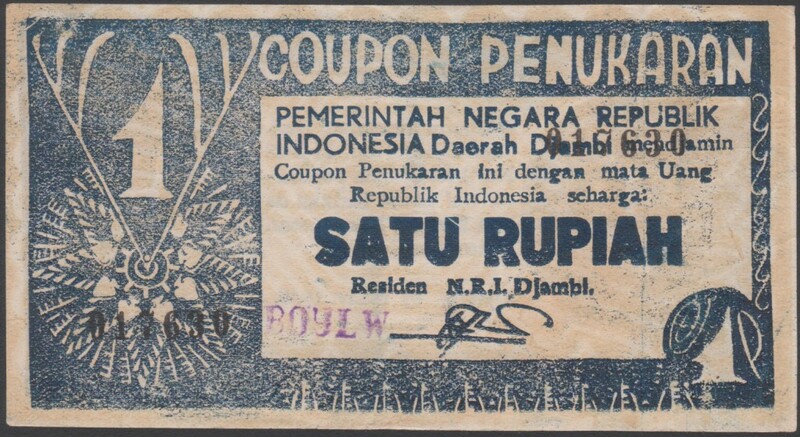 This 5 rupiah note has two different types. 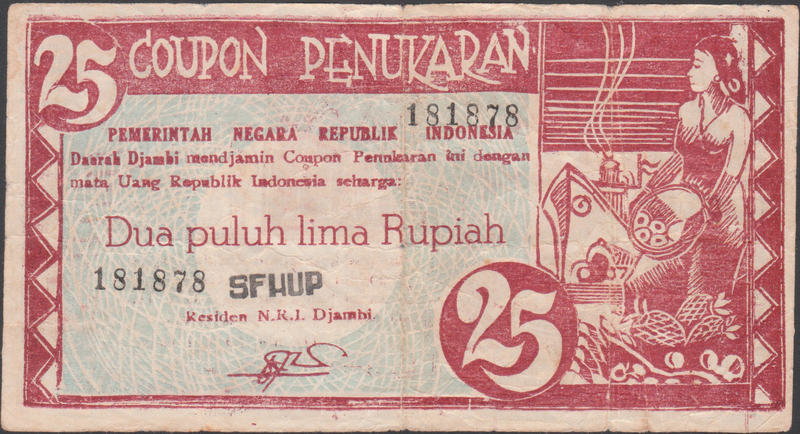 7 There are large quantities of this combination available on the collectors market. 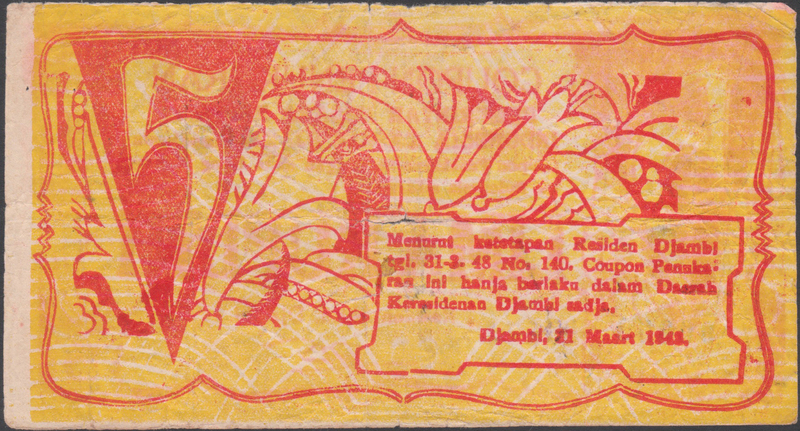 8 KlXPCE is not observed, however KeXPCE is known. Possibly the letter ‘e’ is used to avoid confusion between the letter ‘l’ or the number ‘1’. 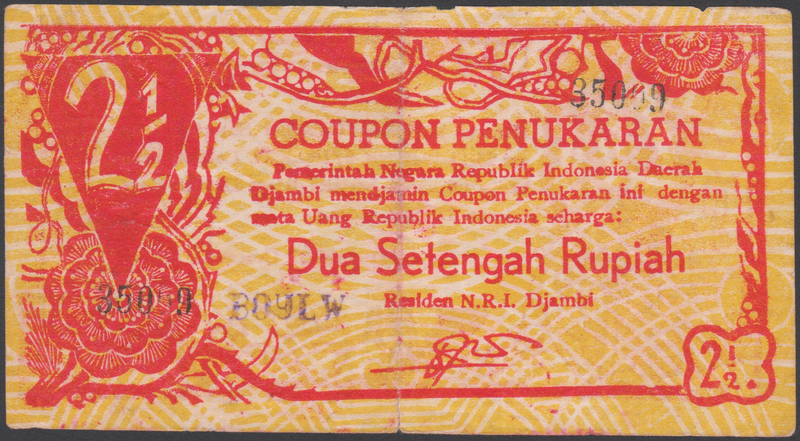 9 There are large quantities of this combination available on the collectors market. 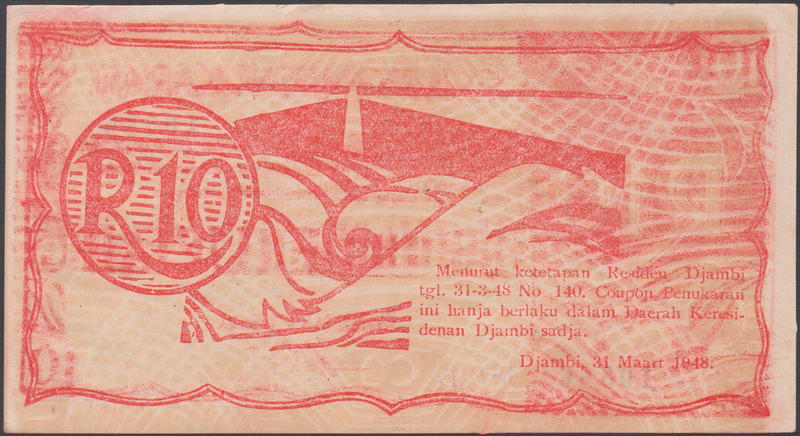 10 There are large quantities of this combination available on the collectors market.